We’ve heard the amazing power and wonders of chatbots for a little while now, and I have even hailed them as being one of the next best things for customer service and support. But, of course, nothing in life is perfect, and chatbots aren’t quite anywhere near that level of maturity just yet. Yet as AI becomes more and more powerful, and will continue to do so as time goes on, chatbots themselves will grow in their capabilities — but there will be some growing pains. 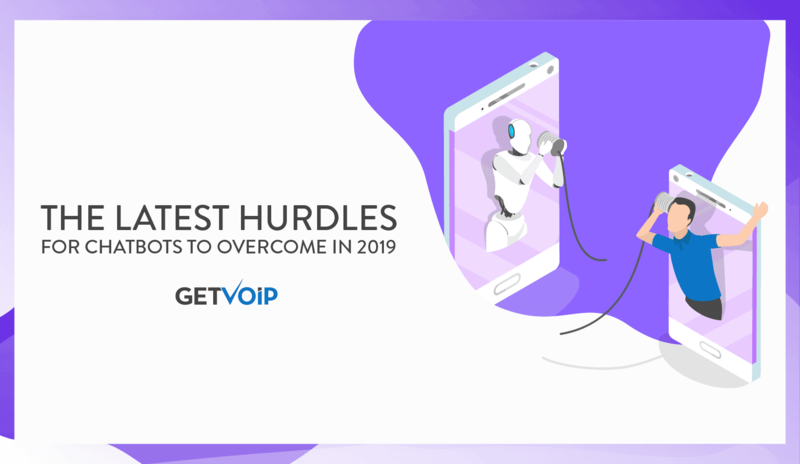 In fact, there’s quite a few growing pains that chatbots already experience, with some very specific challenges that will need to be addressed coming in 2019. Organizations are continuously working to improve their customer experience, but it can be difficult going after moving goal posts. Customer demands can rapidly shift, and just in the last few years we have seen entirely new expectations for organizations arise. Chatbots can absolutely offer businesses a new way to support their clients, but we have to be aware of the challenges chatbots face in 2019 in order to effectively leverage their capabilities. When attempting to frame context around a specific technology, and its current real-world capabilities, I always like to turn to standardized methods of measuring expectations and success. 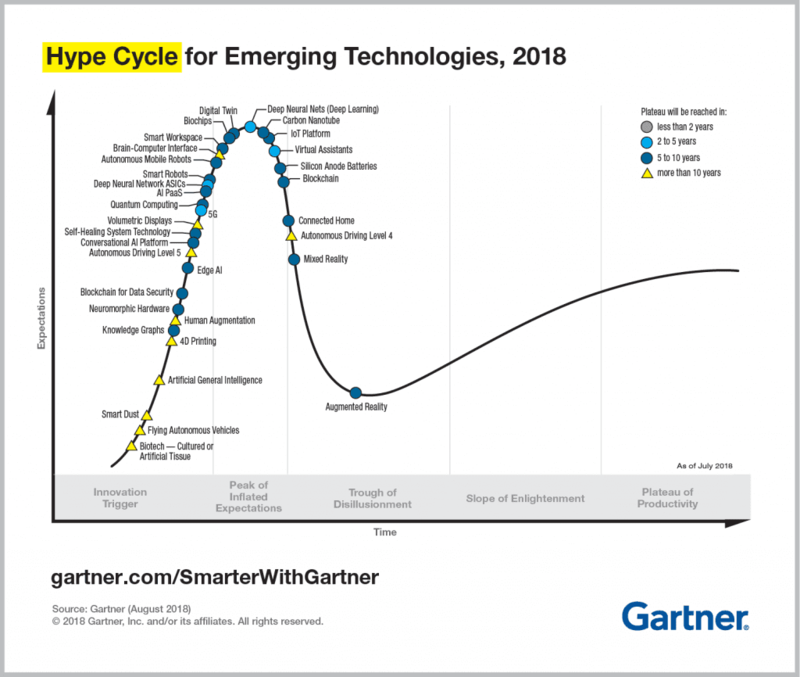 One such measure I normally turn it so the Gartner Hype Cycle, which can outline and help us better understand where a current technology is along its “Hype Cycle,” and how far this solution might be from actual real-world use. If we jump two years forward and take a look at the Hype Cycle for Emerging Technologies in 2018, we’ll notice that there is now “Conversational AI Platform” and “AI PaaS” specifically rising up in expectations, with plateau results estimated to be reached within 5-10 years. 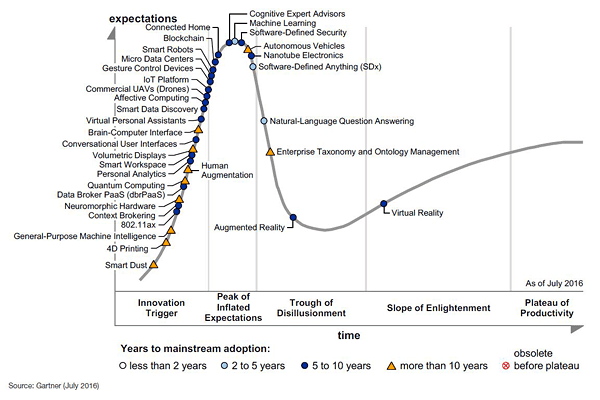 However, we can also notice “Virtual Assistants” moving towards the “Trough of Disillusionment,” with a plateau expected to be reached in only 2-5 years. So what does this mean for chatbots? Well, associated technologies are either still within that point of inflated expectations, and just beginning to reach the period of disillusionment, when we begin to recognize the faults of that technology and understand the capabilities might not be as far-fetched as originally promised. This isn’t a bad thing, we just need to know how to manage our expectations, and leverage the technology in the best way possible. This also isn’t to say Chatbots aren’t around, they are here and here to stay. In fact, Marketsandmarkets research from 2017 discovered that back in 2016, the chatbot market was roughly valued around a whopping $703 million, and Opus Research also noted in 2017 that there is an expected $4.5 billion to be invested in intelligent assistants by 2021. So, while chatbots are clearly here to stay, we really do need to understand their limitations to help us better manage our expectations. If we have a better understanding of exactly what chatbots are capable of, we can then better understand how to properly utilize and optimize them for the best ROI. AI is nowhere near as accessible as we want it to be: this can be recognized by the Gartner Hype Cycle, as well. Sure, AI is making its way into chatbots, and other UX tech, but in reality, the usage and accessibility is limited by nature. Bots struggle to understand context: This is a challenge we will be touching on quite a bit, as it is an overall theme and main reason behind the struggle of bots. Without a human “memory,” buts struggle to pull in relevant information for a more human conversation. Integration can be limited: As with any cloud service, it isn’t a guarantee that your solutions and tools will play nicely together, and there is no guarantee that a specific bot will work with your specific platform of choice. This also comes back to limited accessibility. The UX collective goes into far more detail, and explains quite a few more limitations, but these were some of the three main limitations that are keeping Chatbots from being as capable as they truly can. With a limited form of AI, and the inability to understand context, chatbots can struggle to provide a human touch, what most of us in need crave. On the other hand, the inability to integrate neatly into existing tools, and a lack of accessibility, makes it difficult for organizes to develop and establish a consistent user experience — this kind of problem is exactly why Vonage made the recent acquisition of Dimelo. 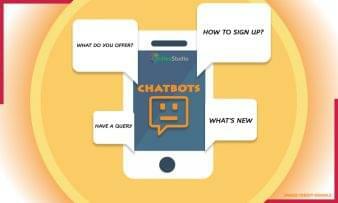 Most of the challenges that chatbots have been, and will continue, to face are surrounding these limitations. It is important for organizations to be aware of these challenges to not only help them manage their expectations of what a chatbot can do, but better understand how a chatbot will fit into their entire contact center toolbox. It has become clear that social media marketing is quickly being surpassed and overtaken by messaging applications. As of just a year ago, in January of 2018, there were millions of users spread across more than 10 popular mobile messaging applications, as seen in research done by Birdsbeep. This means that just a year ago, for organizations to reach the largest number of users, they would need to be spread across 11 different messaging applications. This also doesn’t include your organization’s own application and website, which are critical landscapes for chatbots as well. This is quickly becoming a larger challenge for organizations. Thankfully, as we can see, a large number of users can be reached on just the top few mobile messaging applications — but this is still an issue to address. Organizations must now manage website chatbots, potentially in-app chatbots, and chatbots on numerous messaging platforms to ensure maximum coverage and accessibility for users. Organizations will have to begin to properly prioritize different channels or methods of communication, and recognize where users are most likely to interact with bots. Chances are that the number of applications will only continue to rise, and we will even begin to see the need for bots to be injected into other forms of texting like RCS. Artificial Intelligence is quite obviously becoming incredibly popular, particularly within the Contact Center and Customer Engagement industry. AI is also, quite obviously, an important cornerstone of chatbots. Within their simplest configuration, chatbots are follow a simple and basic “if>then” rule, but have grown in capabilities thanks to powerful Artificial Intelligence. But, as we have seen, AI is just as equally as hyped as chatbots themselves. Both developers building chatbots, and those implementing chatbots within their business, must know how to and when to properly leverage different forms of AI. For example, Natural Language Processing will be necessary to properly understand context, while Sentiment Analysis enables chatbots to understand when the conversation should be escalated to a human agent. As even more AI solutions and technologies are developed, users and developers will only have even more options to wade through. Sentiment Analysis is great for assisting agents by understanding how a customer is currently feeling, but can fall short on assisting chatbots in naturally reacting to a human/ But just because a chatbot can read that human is upset, doesn’t mean it can respond in a way that will help that customer feel better. Not only do we need chatbots to be accessible, and on the same platform, as consumers; but, they need to provide actual meaningful connections, as well. Now, we need to manage our expectations here again. This doesn’t mean that chatbots are going to ask about your day and provide life advice, that’s just a waste of time. Yet, we want our chatbots to provide a true meaningful experience, and provide that human touch without the need for a human. The most obvious thing to do is have your chatbot welcome visitors to your website with a quick hello, but chances are most users will click right out of this. We need to encourage users to actually engage with chatbots, and chatbots need to be configured to not only encourage that engagement, but provide meaningful results from it as well. Chatbots should be utilized to provide call-to-actions for users. As my colleague Nick wrote, “the customer needs to feel like they should interact with the chatbot,” and simple call-to-actions, like buttons within an introduction message to streamline the conversation, can ensure that customers will engage and actually find the help they need. Possibly the largest downfall of chatbots is their lack of a human memory , they will quickly forget what you were just discussing. This is a limitation based on how bots are built and designed, and simply an aspect of their “personalities” because of this. Without the ability to recall previous information and context, chatbots are missing out on a wealth of information that they can utilize to better serve users. Context is key. With an improved memory for chatbots will come better usage of existing context — chatbots that can remember and reference the previous conversations, or other details like web pages last visited or products last searched, will be able to provide better support and flow with the conversation in a much more natural manner. This ties in with providing that human touch, as well, as part of that “human interaction” comes with the natural flow of a normal, human conversation. Developers and organizations must come to leverage both this conversational context, but also physical context clues as well — like those uncovered from the user’s previous actions within your organization’s application or website. By combining these two levels of context, and leveraging that information, chatbots can provide a more human connection with much, much better service. Sadly, security has never really been a top priority for many organizations. We’ve seen time and time again with recent data breaches that companies do not take the storage of private customer information seriously enough, with even names as are large as Amazon and Uber experiencing data breaches. For any organization that is dealing with payment or personal information, security should be an absolute must, not just a consideration. That’s exactly why major credit organizations developed and adopted PCI regulations. The same can be said for any form of communication, and that means chatbots as well. If customers are making purchases or in anyway providing their personal and private information through your organization’s chatbot, it is your organization’s absolute responsibility to ensure that data, if stored, is properly protected. Chatbots should be utilized advanced encryption, and every organization should be following even the most basic security protocols — 2019 is the time when companies should be working to secure data, and chatbots are a unique use-case that many organizations probably do not consider when discussing security. Speaking of data, there is an absolute good side to data as well. Organizations can, and should, utilize as much data as they can to optimize their overall business process. Chatbots in particular, like other points of the customer experience, can be specifically optimized through the collection and analysis of data. But as the number of engagements and interactions between users and bots increases, the sheer amount of data that organizations will have to store and manage will become difficult to handle. This of course ties in with security, as large sets of data are particularly vulnerable and must be protected. Organizations must find a way to properly organize, collect and manage all of this data. In fact, businesses should better understand exactly what data is even necessary to improve their chatbots, and work to minimize the amount of data collected to prevent any issues from developing in the first place. Europe already has GDPR, and it is only a matter of time until the U.S. and other nations follow suit, thinking about data collection and management must happen now in 2019, and chatbots are absolutely ripe for data collection. While potentially a good problem to have, there is an issue of accessibility on the rise with two sides to the same coin. On one hand, we have an intense level of accessibility, almost an overload of options if you will, making it difficult to find the right solution. For example, back in 2016, Facebook Messenger was already supporting over 34,000 different chatbots. 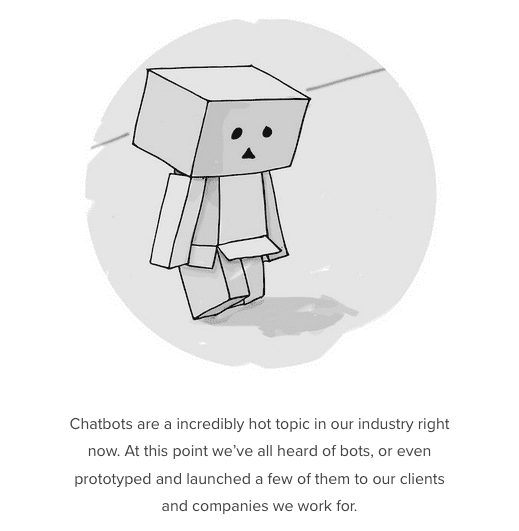 This level of an over saturated market makes it difficult for organizations to find the right chatbots for their platform, it makes it difficult for platforms like Facebook to understand how powerful chatbots are (beyond how many they offer), and as noted by Clickz, this also makes it difficult for developers of chatbots to truly understand how their bots are being used, and how they can be improved. With so many options, the best bot in the world could simply be hidden at the bottom of the list. On the other hand, a lack of accessibility can also prove to be an issue. As I noted, a large limitation of chatbots is the inability to integrate with existing tools, or the lack of development for a specific platform. For example, with so many devs focused on Facebook Messenger, Whatsapp (also owned by Facebook) could be missing out on other strong options. Or, an organization that is focused heavily on Facebook Messenger may not be able to afford multiple chatbots on multiple platforms. 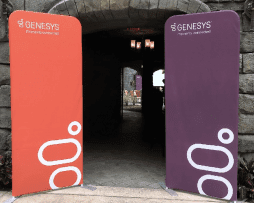 While not every single organization or business may have a global reach, multi-language support is always necessary when looking to connect with customers. Contact Centers have been including multi-language support within their IVR menus for years now, and chatbots should be seen as a natural extension, and even more-so. Chatbots help expand your organization’s reach, both nationally and internationally, enabling users to interact with your organization at any time of the day — 24hr support is one of the strongest use-cases for chatbots after all. Without the ability for chatbots to interact with users in multiple languages, your organization will be missing out on connection with a large number of potential clients. Natural Language Processing AI has a unique issue when it comes to multi-language support, and can struggle to adapt to not only different languages, but different dialects and colloquial terms, as well. This is a unique problem that should now be addressed, as chatbots truly push their way into the main stream support arsenal of a contact center in 2019. Chatbots can be a very powerful way to revolutionize the level of support your organization or contact center can provide. By supplementing human representatives with chatbots that users can interact with whether through your website, mobile application, or even popular messaging apps, your business can expand its reach globally, and provide service 24 hours, 7 days a week. However, chatbots are not the be-all, end-all of human support, as we have discussed previously. There will always be a time when a human touch is truly necessary to provide the level of support and personalization that clients and users seek and demand. Organizations must be able to recognize how and when to properly leverage chatbots within their customer engagement portfolio, and along with that comes recognizing and identifying the unique challenges that chatbots face. In 2019, Chatbots will not only grow their unique capabilities, but they will run into some unique challenges as well. Not to mention, as our technological climate shifts, and consumers demand more privacy and stronger data control, organizations must be able to adapt all of their communications, including chatbots.